Sure, if your only goal is to outdo your showboat of a neighbor (who drives around in a convertible in December, anyway?! ), then you probably don’t need a TV size guide – though you might need to build a bigger wall to hang your TV on. If you do decide to go that route, Puls can help mount that massive screen for you, by the way. 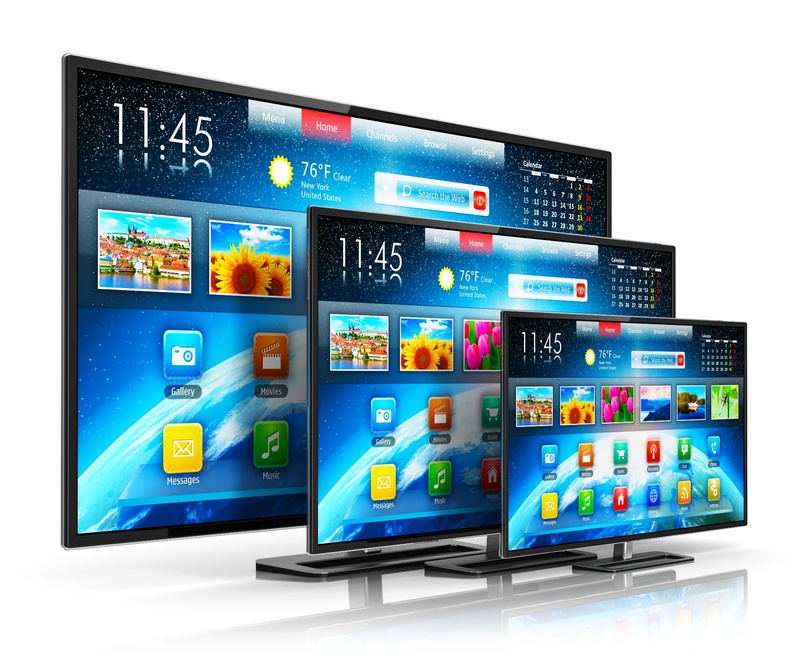 But if you’re more into the quality of your viewing experience, there are definitely a few more factors to consider in terms of what size TV you’ll want to buy. Some of it has to do with room size, some to do with the technology you opt for, and, of course, there’s always budget to consider. It may sound like a lot, but don’t worry – with our TV buying guide, you’ll soon find the happy medium. There are both technical and aesthetic things to think about when deciding what size TV to buy. For example, while there’s always the urge to purchase the biggest screen possible, there’s also the question of whether you should go that route. Whether you simply don’t have the wall space, or whether your significant other swears that you’ll be sleeping on the sofa if you spring for that 110” TV, sometimes bigger isn’t always better. It’s also important to bear in mind that sitting too close to a television can actually decrease the quality of your viewing experience. That’s because if you’re right in front of the TV, your picture can appear pixelated (and you can appear quite silly, depending on just how close you happen to be). So, what’s the perfect distance to sit from a TV? That depends on the kind of TV that you’re watching on. There’s also some added flexibility here if you’re using a TV wall mount rather than the included TV stand. If you’re watching on a 1080p standard HD TV, the sweet spot of how far away to sit falls somewhere between 1.5 to 2.5 times your TV size. That is, if you have a 60” television, you’ll want to sit about 90” to 150” away. Now, 150” is 12.5 feet, which is all well and good if you’ve got a room that’s conducive to you sitting twelve-and-a-half feet away from your screen. If, however, your room is smaller, or is full of tall things that might impede your view (such as other humans), you might want to opt for a smaller set that you could sit closer to. 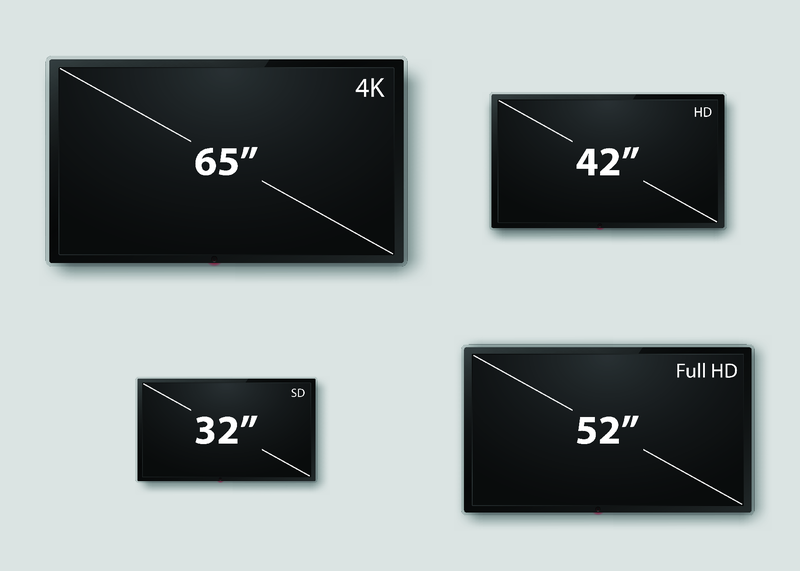 Alternatively, most manufacturers have moved to emphasizing production of 4K TVs over standard HD. Practically speaking, what this means is that because the pixels are smaller, you can sit closer to the TV – in fact, you should sit closer to the TV – and you won’t suffer from the same pixelation as with standard HD. Most experts put the distance ratio of a 4K TV at around 1 to 1.5, which means that if you have a 60” TV, you’ll want to sit 60” to 90” away. This of course comes with an inverse implication – if viewing on a 4K screen, you might need to upgrade in size in order to make up for viewing farther away. Now, if your budget allows, our TV buying guide suggests that you opt for the 4K TV and scale up in size – you’ll benefit from a higher quality picture, and though the cost of a 4K TV is slightly higher than that of a standard 1080p TV, the bump in price isn’t astronomical, and the standard is moving towards 4K anyway, making the higher-resolution TV an investment that will last you well into the future. No matter which size TV you end up choosing, Puls can mount it for you, as well as provide a host of other services from setting up a surround sound system, to neatly concealing cables, to programming your new remote. Simply hop online and book a time slot that’s good for you, and a certified Puls technician will show up at your door, ready to take care of all your TV installation needs from A-Z. We’ll bring your choice of bracket (fixed, tilt or full-motion) to you as part of your appointment, to make things as easy and seamless as possible. Jake Sherman is a professional writer with a background in journalism. He is fascinated by home appliances and how they work. He enjoys breaking down complex topics and explaining them in interesting ways. 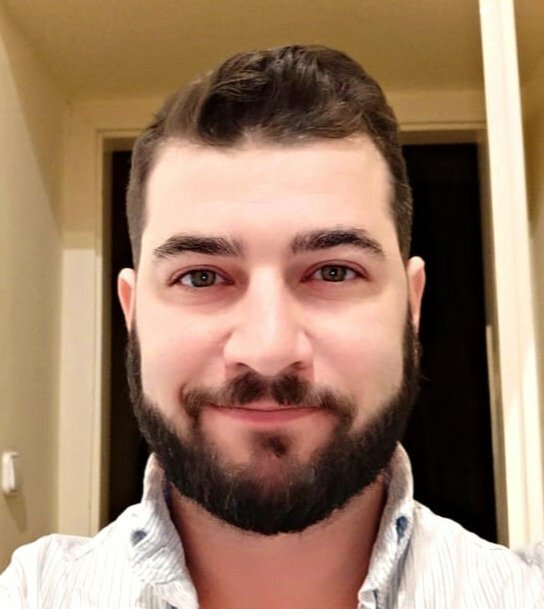 He has been a Puls staff writer for two years. When he's not writing, he enjoys trotting around the globe, trying unfamiliar foods, and testing unmarked doors to see if they're locked.